Cloud computing is fast emerging as a new consumption and delivery model for IT solutions. Two distinct cloud patterns have evolved. Private clouds are custom cloud applications that are on premise to companies. Public clouds are owned and managed by a service provider and are delivered on a pay-per-use basis. Although the debate between the use of private versus public cloud continues, the industry is moving ever faster toward a hybrid solution. Hybrid clouds address the integration of traditional IT environments with one or more clouds, private and public. 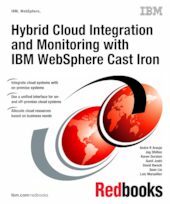 This IBM Redbooks® publication is intended for application integrators, integration designers, and administrators evaluating or using IBM WebSphere Cast Iron. In addition, executives, business leaders, and architects who are looking for a way to integrate cloud applications with their on-premise applications are shown how WebSphere Cast Iron can help to resolve their integration challenges. The book helps you gain an understanding of hybrid cloud use cases, and explains how to integrate cloud and on-premise applications quickly and simply.